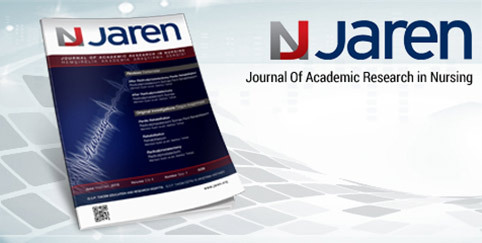 The Journal of Academic Research in Nursing (JAREN) is a double-blind, well-respected journal, featuring experimental, basic, and specific clinical trials in the field of nursing / midwifery and health sciences; post-graduate education, case reports, history of medicine, publications and research ethics. The referees that the editors will consider as the main factor in the selection of the text are selected from external independents who are experts in their field. For experimental, clinical and drug research, an appropriate ethics commission report is required for relevant international agreements. All surveys submitted for publication in the journal are to be submitted to the Helsinki Declaration / Laboratory Animal Care Guide (Helsinki Declaration of 1975, revised 2008-http: //www.wma.net/en/30publications/10policies/b3/index.html, "Guide forthecareanduse of laboratoryanimals - www.nap.edu/catalog/5140.html and the Guide for theCareandUse of Laboratory Animals). The submitted inquiries should indicate that informed consent has been received from the participants. It should be noted that informed consent has been obtained from persons who are primarily responsible for individuals who are not competent to make decisions (children, patients in coma, etc.). If any financial support has been provided to the submitted works, the authors should explain what kind of a relationship it is; if there is a relationship of interest with the institutions providing this support. Regularity (ethical, scientific, legal, etc.) of the articles is the responsibility of the authors. All of the authors should join the edition with their signatures which reports their scientific contributions, percentages and their responsibilities and there are no conflicting interests. The monetary and ocular aids that are provided to research should be reported as a P.S note from which corporations, pharmaceutical companies they have been provided (ICMJE Form for Disclosure of Potential Conflicts of Interest). The format of the articles should be organized according to the rules of ICMJE-RecommendationsfortheConduct, Reporting, Editing andPublication of ScholarlyWork in Medical Journals. The presentation of the Original Investigations and Compilations should be organized according to the study report guidelines: CONSORT for randomized trials, STROBE for observational trials, STARD for diagnostic value trials, PRISMA for systematic reviews and meta-analyzes, ARRIVE for animal trials, TREND for intervention studies. Original research, even some case presentations, must be submitted by the ethics committee approved by the institution where the general ethical rules are published, or an equivalent letter of acceptance must be submitted. The thoughts and suggestions in the writings are entirely the responsibility of the authors and do not reflect the opinions of the Editor and the assistants. Articles submitted for publication in the journal should not be published elsewhere. The abstracts that is not much more than 200 words that were previously presented at scientific meetings can be accepted with the condition to be disclosed. Withdrawal request without a reasonable cause for articles for which the procedures have been fulfilled and which are close to decision phase is included within the scope of “rejection”. For articles accepted for publication, first author is deemed to have accepted that revisions will be made by Editors without making any fundamental change to the text, as in Turkish and English. Prerequisites for the articles to be accepted for publication in the journal are having the potential of citation, being original and at scientifically and academically high level. In the JAREN - NURSING ACADEMIC RESEARCH DOCUMENT, the articles which have not been published elsewhere, which are not evaluated by the referee and evaluated by the Editorial Board and Advisory Board are printed. All rights of published texts and images belong to the magazine. If the journal is cited, the journal should be identified as the source. If the text was previously presented at a scientific meeting, it should be marked with a (*) in the beginning of the text and must be explained by specifying the name, location and date of the meeting at the end of the first page of the text.If the research consists of scientific expertise or a doctoral thesis, it must be stated in the title with a (*) sign and after the mark (*) it should be explained that it is an Institute, Year, Master or Doctorate thesis at the end of the first page of the text. The articles that submitted in the journal should be written in Microsoft Word program in A4 paper size, 1.5 cm spacing, 12 point font and Times New Roman font, leaving 2.5 cm space on each page. Page numbers must be specified in the bottom right-hand corner starting from the page where the text starts. The research articles should not exceed 15 pages, compilation and case presentations should not exceed 8 pages. Articles can be posted online at www.jarengteah.org. The author / authors should fill in the "Copyright Notice Form" and submit it by signing and writing. Authors who write articles to our magazine; they must adhere strictly to the following ethical principles. In all studies involving the "human" factor, the Declaration of Helsinki states the principles set out in the "Guide to Good Clinical Practices" and "Guide to Good Laboratory Practices" and T.C. It accepts the principle of compliance with the relevant regulations of the Ministry of Health. In researches related with humans, it is obligatory to obtain permission from the Ethics Committee for Clinical Investigations and submit the relevant documentary journal. Authors must state that they have received an informed consent document signed by the relevant ethics committee and those involved in the study in the method section of the articles. If a copy of the approval of the Ethics Committee is not sent to the magazine, the article will not be published. Regardless of the identity of the patient in the case presentations, "InformedConsent" documentation should be obtained from the patients or, where appropriate, the legal representative, and the article should be written in writing under the title of the case presentation. The "Informed volunteer" document must be sent to journal from the patient or legal representative. Conflicts of Interest: Authors should report conflicts of interest (if any) about their articles. If the article includes direct or indirect commercial relation (such as recruitment, direct payments, having stocks, company consultancy, patent licensing adjustments or service fee) or an institution that provides financial support for the trial, the authors have to state that the article does not have any commercial relation with the commercial product used, drug, company, etc. and, if the otherwise is present, then they have to state the nature of relation in the cover letter as well as under the title of “Conflict of interest” before References section of the article. Authoring Contribution: In many written articles, authors' contributions to the research should be presented in an editorial form (within the scope of publication right transfer form), which should be explained and signed, such as idea formation, study design, experimental applications, statistics, writing of the article. Financial support: Financial support for the research, donation and all other editorial (statistical analysis, English / Turkish assessment) and / or technical assistance must be clearly communicated prior to the article's resource section. In addition, the authors must declare the roles of sponsors in the following areas, (1) design of the employee, (2) data collection, analysis and interpretation of the results, (3) writing of the report, (4) decision to submit for publication. The articles sent to the journal should be arranged to include the following sections. In the application process, authors should check the conformity of their submissions to all the materials listed below, those applicants who do not comply with this guideline will be returned to the authors. The submitted article must not have been published before, or should not have been submitted for the evaluation of another journal. In the article there should not be author name and contact information. The shipment file must be in the form of a Microsoft Word document file. All shapes, pictures and tables should be placed in the appropriate spot within the text. For printing, quality copies of images can be sent as additional files. The Ethics Committee resolution must be installed (in the add-on files). The Copyright Transfer Form should be attached. Title of the article both in Turkish, and English, name, surnames, titles of the author(s), name, and address of the institute they are working for, the name, office phone, GSM, e-mail, and address of the corresponding author should be indicated. A statement indicating that this article was not previously published elsewhere, and the funding source (if any) should be written on this page. Research articles; should not exceed 15 pages. Abstract: Abstracts written in Turkish and English should encompass concisely the main ideas of the study, and contain both Turkish and English titles and at least 150, and at most 200 words. English abstract should be written in compliance with the Turkish abstract. English abstracts must have objectives, methods, results, and conclusion sections, and Turkish abstract must have their Turkish equivalents namely amaç, yöntem, bulgular, sonuç; In both abstracts key words should consist of at least 3, and at most 5 words. Key words in English should comply with “Index Medicus: Medical Subject Heading (MeSH)” standards. Turkish key words should comply with “Turkish Scientific Terms”. The Abstract section should not contain new information or results not mentioned in the main text, and any reference should not be cited. Introduction: Scientific basis of the subject of the research, its current importance, and its rationale should be indicated. Method: The type of the investigation/research, study population, and sampling, data collection tools, and methods, its relevant problems, limitations, permission, and approval of the ethics committee, evaluation of data, interventions performed in experimental studies should be indicated. Results: The results obtained are indicated in table(s)/figure (s)/graphics or illustration(s). Titles of the tables should be written above the table, while captions of the figures, and graphics should be indicated below them. All initials of the words contained in these titles, and captions should be written in capital letters. The tables should be enumerated in the Word program without slashes inbetween. Original source of the table(s)/figure(s)/graphics cited should be indicated below them. Statistical tests, and abbreviations used, and relevant explanations should be written below the table/figure/graphic in 8 font size and indicated with an asterix (*). Table(s)/figure(s)/graphics should be placed in the main text in order of their first mention. Discussion: The outcomes of the investigation should be discussed in consideration of the findings of other studies, and comments of the authors, and in the light of the literature. Conclusion, and Suggestions: It should contain suggestions in compliance with the outcomes of the study. It should also encompass issues such as contribution of the study to the nursing science, and its guiding role for further studies. Review articles; In these articles, discussions, and opinions of the author (s) about current issues, and those in need of further explanation are presented in the light of the national, and international literature. It should not exceed total of 8 pages. Case report; They are about rarely seen cases which differ in diagnosis, treatment, and patient care.They should be reinforced with adequate number of photos, and graphics. Editorial letter An editorial letter may be written for opinions, contributions, criticisms or previous experiences or thoughts on a different topic. Such writings should not exceed 500 words and must be taken in accordance with ethical rules. If the letter is about a printed article the year, number, page numbers, title of the post and the names of the author / authors should be indicated. If the letter is about experience in one subject, sources must be specified in accordance with the rules of the magazine in accordance with the information given. The number of resources is limited to 5. The answer of the letter is also published by the editor or author of the article again in the journal. Firstly extended form of the abbreviation should be written, and then its acronym/abbreviation should be indicated in parenthesis, and used throughout the text. For internationally used abbreviations/acronyms the author may refer to “Rules of Scientific Writing”. Accuracy of the references is under the responsibility of the author(s). The following rules should be taken into consideration in writing references. References should be numbered in order of their first appearance in the text. A comma (,) should be inserted between more than one references. References should be presented as a separate list at the end of the text, and numbered in order of their first appearance in the text. The name of the journal should be abbreviated in compliance with the lists published in Index Medicus/Medline/PubMed (abbreviations of the names of the journals are available in the MEDLINE list of journals published every year by NLM www.nlm.nih.gov/tsd/serials/lji.html). If the name of the journal is not contained in this list, its full name should be written. If the number of the authors in a reference is less than 6, then all of them should be written, otherwise abbreviations of “ve ark. “in Turkish, and “et al.” in English should be added after the name of the 6. author . After the name(s) of the author(s) complete title of the manuscript, and the journal, year, volume, and relevant pages should be written. Çiyiltepe M. Yutma bozukluklarının rehabilitasyonu. Türkiye Klinikleri 2004; 4 (3): 195-201. Savcı C, Şendir M. Evaluation of health related quality of life in patients with Parkinson’s disease. Neurosciences 2009; 14 (1): 60-6. Bolat F, Uslu S, Bolat G, Bülbül A, Arslan S, Çelik M ve ark. İlk 6 ayda anne sütü ile beslenmeye etki eden faktörler. Çocuk Dergisi 2011; 11(1):5-13. Türk Hemşireler Derneği. Hemşirelik için geleceğe yönelik stratejiler. Klinik Forum 1992; 105: 23-5. Çocuk Hekimi Gözüyle Yaşlılık. Geriatri 2000. 2000; 14:1. Ciment J. US senate pases patients’ bill of rights. (News). BMJ 1999; 319: 209. Büken N, Büken E. Tıp etiği ve tıp hukuku açısından klinik ilaç araştırmaları. Türk Psikiyatri Derg 2003; 14: 289-99. Nazik HD. Hormon replasman tedavisinin yararları ve zararları: Klinik uygulamalardan örnekler. Focus 2002; (2): 882-84. Bertram E, Bertram B. There is nothing automatic about right. Am Journal of Nurs May 1977: 867-72. Terakye G. Psikiyatride etik ikilemler. 3P Dergisi 1994; 30-33. LaPorte RE, Marler E, Akazawa S, Sauer F. The death of biomedical journals. BMJ [online]. 1995;310:1387-90. URL:http://www.bmj.com/bmj/archive/6991ed2.htm. September 26, 1996. Covell K. 2007. [4 screens]. URL: http:// www.voicesforchildren.ca/index. April 24, 2007. The Oxford english dictionary [CD-ROM]. 2nd ed. New York, NY: Oxford University Press; 1992. Görgülü RS. Hemşireler için fiziksel muayene yöntemleri. İstanbul: Tıp Kitabevi; 2014. s. 1-44. Thompson IE, Melia KM, Boyd KM. Nursing ethics. 2nd Edition. Edinburg: Churchill Livingstone; 1988. p. 456-78. Hacettepe Üniversitesi Nüfus Etütleri Enstitüsü. Türkiye nüfus ve sağlık araştırması 2003. Ankara: Hacettepe Üniversitesi Nüfus Etütleri Enstitüsü; 2003. s. 56-72. Phillips SJ, Whistant JP. Hypertension and stroke. In: Laragh JH, Brenner BM, Eds. Hypertension: Pathophysiology, diagnosis, and management. 2nd ed. New York: Raven Press; 1995. p.465-78. Acaroğlu R, Şendir M, Kaya H. Hemşirelik Süreci. In: Babadağ K, Aştı T, Eds. Hemşirelik esasları uygulama rehberi. İstanbul: Medikal Yayıncılık; 2008. s. 8-20. Kansu E. Bilimsel yanıltma ve önlenmesi. In: TÜBA Dünyada ve Türkiye’de bilim etik ve üniversite. TÜBA Bilimsel Toplantılar Serileri No: 1. Ankara: 1994. s. 71-5. Kimura J, Shibasaki H, editors. Recent advances in clinical neurophysiology. Proceedings of the 10th International Congress of EMG and Clinical Neurophysiology; 1995 Oct 15-19; Kyoto, Japan. Kömürcü N. Ebe ve hemşirelerin cinselliğe ve bu konudaki danışmanlık rollerine ilişkin tutumları. 3.Ulusal Hemşirelik Kongresi; 22-26 Haziran 1992; Sivas. Acaroğlu R, Şendir M, Aştı T, Altun İ. Hemşirelik araştırmalarında deneklerden bilgilendirilmiş izin alınma durumlarının incelenmesi. IV. Ulusal Hemşirelik Eğitimi Sempozyumu; 10-12 Eylül 1997; Kıbrıs. Brandes U, Wagner D. A bayesian paradigm for dynamic graph layout. In: DiBattista B (editör), Proceedings of the 11th International Symposium on Graph Drawing; 2003 Nov 12-15; New York, USA; 2003. p. 236-7. Koç G, Eroğlu K. Doğum sonu erken taburculuk ve evde bakım hizmeti. In: 4. Uluslararası Üreme Sağlığı ve Aile Planlaması Kongresi Bildiri Kitabı; 20-23 Nisan 2005; İstanbul, Türkiye. Delta Basım: İstanbul; 2005.s. 87-8. Aktaş A. İnmeli hasta yakınlarına verilen eğitimin; hasta ve hasta yakınının yaşam kalitesi, anksiyete ve depresif belirti düzeyi üzerine etkisi. İstanbul Üniversitesi Florence Nightingale Hemşirelik Yüksekokulu Hemşirelik Esasları Anabilim Dalı Doktora Tezi. 2010. Kaplan Sl. Post-hospital home health care: the elderly access and utilization (dissertion). St. Louis (MO): Washington Univ. 1995. Blind arbitration is a method applied for publishing scientific publications with the highest quality. This method is the basis of an objective evaluation of scientific studies and is preferred by many scientific journals. Referee views have a decisive place in JAREN's broadcast quality. All works submitted to our magazine are evaluated by blinding according to the following steps. JAREN uses the double blind method in the evaluation process of all studies. Author and reviewer identities are hidden in the double blind method. The works submitted to our publication are first evaluated by the editors. At this stage, studies that are not in line with the aim and scope of the magazine, that are weak in terms of language and narrative rules in Turkish and English, that contain scientifically critical mistakes, that do not have an original value and that can not meet publication policies are rejected. The authors of rejected studies are notified. Eligible studies are sent to a field editor for the field in which the study is relevant for the preliminary evaluation. In the preliminary evaluation process, the field editors examine in detail the studies, introduction and literature, method, findings, result, evaluation and discussion sections in terms of journal publication policies and coverage and originality. As a result of this review, works that are not suitable are returned with the field editor's evaluation report. Eligible studies are awarded to the reviewing process. Studies are reviewed according to their content and the expertise of the reviewers. The field editor reviewing the work may propose at least two reviewers from the JAREN reviewer pool according to their field of expertise or may propose a new reviewer appropriate to the field of study. The reviewer suggestions coming from the field editor is evaluated and the studies are forwarded to the reviewers. Reviewers are obliged to guarantee that they will not share any process or document about the study they are evaluating. 1. Introduction and literature: The evaluation report contains opinions on the presentation and purpose of the problem addressed in the study, the importance of the issue, the scope of the relevant literature, the currency and the originality of the study. 2. Method: The evaluation report contains information on the appropriateness of the method used, the choice and characteristics of the research group, information on validity and reliability, as well as on the data collection and analysis process. 3. Findings: The evaluation report includes opinions on the presentation of the findings in the frame of the method, the correctness of the analysis methods, the aims of the research, the consistency of the findings, the necessary tables, figures and images, and the conceptual evaluation of the tests used. 4. Evaluation and discussion: The evaluation report includes opinions related to the discussion of the subject, suitability to research question(s) and hypotheses, generalizability and applicability based on the findings. 5. Conclusion and recommendations: The evaluation report includes opinions on the contribution to literature, recommendations for the future work and applications in the field. 6. Style and narrative: The evaluation report includes opinions on the content of the study title, the appropriate use of Turkish language, the submission of references and the provision of references in the language of the full text in accordance with the "Vancouver" rules. 7. Overall evaluation: The evaluation report contains opinions on the originality of the study as a whole, its contribution to the literature and the applications in the area. Reviewers are not expected to make corrections according to the typographic characteristics of the study during the evaluation process. The period given to the reviewer for the evaluation process is 6 weeks. Proposals for corrections from reviewers or editors must be completed by the authors within 1 month in accordance with the "Request for Revision". Reviewers can review the corrections of each study to determine their suitability and, if necessary, request multiple corrections. Opinions from the reviewers are reviewed by the field editor. As a result of this review, the field editor will forward the final decision on the study to the editors. The editors prepare relevant editorial board opinions based on the field editor and reviewer views. The prepared opinions are forwarded to the author(s) by the editor together with the field editor and the reviewer recommendations. In this process, negative reviews are returned without requesting plagiarism audit. Acceptance of studies given positive opinions is given according to the results of the plagiarism audit reports. How long does the Publication Evaluation Process last? It is envisaged that the publication evaluation process of the studies submitted to JAREN will be finalized within approximately 6 months. However, the period between the date which the reviewers or the editors requested from the author(s) for correction and the date the author(s) completed the corrections is not included in this 6-month period. 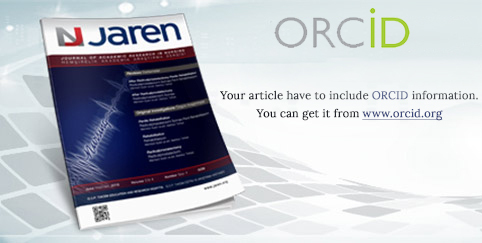 The author(s) who will send studies to be evaluated at JAREN may make a submission by becoming a member of the magazine management system at https://www.journalagent.com/jaren/. The author(s) must follow the guidelines in "Submit an Article Online" to become a member and submit a study. JAREN may require one or more corrections and improvements by editors, field editors and/or reviewers for the studies in the evaluation process. The authors(s) are obliged to complete the corrections and improvements in a complete, descriptive and timely manner, knowing that the proposed corrections and improvements are objective and enhancing the originality of the study. The author(s) are required to upload the corrections and improvements requested to the system in accordance with the conditions specified in "Revision Request". In JAREN All articles are reviewed by the chief editor, editor, statistician and at least two referees. Editors investigate the conformity with the formal rules reported in the editorial guidelines before submitting them to the referees. All articles are evaluated with blind referee application. You can find the details of the process on the following chart. click to download folder. The publication processes practiced in JAREN are the basis for the development and distribution of information in an impartial and respectful manner. The processes applied accordingly, directly reflect the quality of the studies of the authors and institutions supporting the authors. Reviewed studies are studies that embody and support the scientific method. It is important that all partners of the process (authors, readers and researchers, publisher, reviewers and editors) in this point must comply with the standards for ethical principles. It is expected that all partners to assume the following ethical responsibilities under the JAREN publication ethics. Guides and policies published by the Committee on Publication Ethics (COPE) were considered while the ethical tasks and liabilities below were prepared. • Author(s) are expected to send works that are unique. In case author(s) utilize other works or include other works, they are required to refer and/or quote fully and correctly. • Individuals who do not intellectually contribute to the contents during the creation of the work must not be cited as authors. • Situations and relationships of all works sent to be published that could constitute a conflict of interest if any must be disclosed. • Raw data may be requested of author(s) in the scope of evaluation processes, in such a case author(s) must be prepared to submit the expected data and information to the publishing committee and science board. • Author(s) must possess a certificate that they have the right to use the data, the necessary permits regarding the research/analyses or the permission of the respondents that are queried. • In case author(s) notice an error or mistake that is published or is in the early appearance or evaluation stage, they are responsible to notify the journal editor or publisher or to cooperate with the editor in the procedures of notifying the journal editor or publisher, correction or retraction. • Author(s) may not apply their works to more than one journal. Each application may be initiated upon the completion of the previous application. Works that are published in another journal may not be submitted to JAREN. • Changing of the author liabilities (such as adding authors, switching the order of the authors, excluding authors) of any works whose evaluation process started cannot be proposed. • Displaying openness and transparency for the publication in areas that require correction or explanation. Editors must decide by taking into consideration all of the information, skills and experience expectations required by all readers, researchers and implementers. Care must be taken that the works published contribute readers, researchers, implementers and scientific areas and that they are of a unique quality. In addition, editors are liable to consider the feedback coming from readers, researchers and implementersand to provide explanatory and informative feedback. • Editors must make a positive or negative decision based on the importance of the works, its unique worth, validity, clearness of the narration and aims and objectives of the journal. • Works that are suitable for the publication scope must be taken into the pre-evaluation stage for as long as they do not have any major problems. • Editors must not overlook positive referee suggestions for as long as there is no major problem regarding the work. • New editors must not alter decisions made by previous editor(s) for as long as there is no major problem regarding the work. • The "Blind Refereeing and Evaluation Process" must definitely be published and deviations that could occur in the processes defined by editors must be prevented. • Editors must publish an “Author Guide” that includes in detail all issued expected of them. These guides must be updated at regular intervals. • Feedbacks and returns must be made to authors in an explanatory and informative manner. • Referees must be assigned in a manner that is suited to the subject of the works. • They are liable to provide the information and guides required by referees during the evaluation phase. • They must ensure that there is no conflict of interest between authors and referees. • Referee identities must be kept in confidence in the sense of blind refereeing. • Referees must be encouraged to assess the work in an unbiased, scientific and objective manner. • Referees must be evaluated with measures such as on-time returns and performance. • Applications and policies to increase referee performance must be adopted. • The required steps must be taken for the referee pool to be dynamically updated. • Unkind and unscientific evaluations must be prevented. • Steps must be taken for the referee pool to consist of a wide portfolio. Editorsmust ensure that all members of the publishing committee advance the processes in accordance with the publication policies and directives. They must inform members of the publishing committee regarding publishing policies and notify them of developments. They must train the new members of the publishing committee concerning the publishing policies and must provide them the information they need. Ensure that members of the Editorial Board evaluate their work independently and impartially. Determine the members of the new editorial board from those that can contribute and that are appropriate. Send appropriate studies to the editorial board members' expertise for evaluation. Interact with the editorial board on a regular basis. Hold meetings with the editorial board periodically for discussing the publication policies and development of the magazine. Relation ship between editors and the publisher is based on the editorial independence principle. According to the written contract between the editors and the publisher, editors will be give all of decisions independently without asking the publisher and magazine owner. Editors are required of implementing the policies of the "blind arbitration and evaluation process", which are written down in magazine publishing policies. In this context the editors provide all works to be fair, neutral and completion the evaluation process in time. Editors are responsible for every article published in the magazine to be in accordance with the magazine publication policies and international standards. Editors are required to provide protection of personal data related to visuals or the subjects evaluated in studies. They are responsible for refusing the studies unless there is certified consent of individuals used in the works. In addition, editors are responsible for maintaining authors, referees and readers' individual data. Editors are required to provide protection of human and animal rights assessed in the studies. The ethical board approval related to the subjects used in studies is responsible for rejecting when there is no permission for experimental research. Editors are obliged to take measures against possible abuse and misconducting. Beside doing an objective and rigorous investigation about determining and evaluating of complaints concerned with this situation, sharing the findings on the matter is among the editors' responsibilities. Editors must ensure that judgments involving errors, inconsistencies, or misleading appear in the works are quickly corrected. Take into account persuasive criticism of the works published in the magazine and exhibit a constructive attitude towards these criticisms. Give the right of respond to the authors whose works being criticized. Not ignore or exclude studies involving negative consequences. The editors are obliged to carefully review the complaints from the authors, the referees or the readers and respond in an illuminating and descriptive manner. The magazine owner, publisher, and no other political or commercial elements can affect editorial's independent decisions. The editors ensure that the work completes the publication process independently and impartially, taking into account conflicts of interest among the authors, referees and other editors. They only accept work evaluation related to the field of specialization. They should evaluate within impartiality and confidentiality. If they think they are facing a conflict of interest during the evaluation process, they should inform the editor of the journal, refusing to review the work. They should objectively evaluate only the content of the study. They should not allow nationality, gender, religious beliefs, political beliefs and commercial concerns to influence assessment. They should do assessment in a constructive and polite language. They should not make humiliating personal comments that include hostility, slander and insults. They should carry out the work on which they have accepted the assessment on time and within the framework of ethical responsibilities mentioned above. The editors are responsible for all of the procedures of the works that are sent to JAREN. In this perspective, the decision-makers are the editors regardless of any economic or political gain. Protects every article’s ownership and copyright that are published in JAREN and takes the responsibility of every record of the copies that are published. Have the responsibility of taking precautions about all kinds of scientific abuse, reference thievery and plagiarism regarding the editors. If you encounter any unethical conduct or content outside JAREN's above-mentioned ethical responsibilities, please notify the chief editor's office by e-mail. The studies that are accepted as the evaluation results in JAREN go through a respective process such as making plagiarism control, bibliographic editing, reference and citation control, making layouts and type settings, issuing DOI numbers and publishing early printing. Early printings will be published in volumes and issues that the editorial board finds appropriate. JAREN obliges the plagiarism inspection for all of the works that are passed the process of “Blind Refereeing” in order to protect their integrities. In this scope, Turkish and English copies of all of the works are sent to a company which is approved by editorial board for plagiarism inspection. The economic responsibilities that are occurred in the inspection process belong to the authors. Plagiarism inspection is made by using Turnitin and IThenticate software by the publisher. The match-ups of every work that are surfaced by the software are being examined closely and picked over the correct references and citations. The remaining match-ups are being examined and the located errors are documented for the publisher. Editorial board makes its final decision in the light of plagiarism reports of every work. The correction of the errors that are partaking in the works can be asked from the authors or the works can be returned to the author. Scientific research is based on previous works on the scientific field. During the new studies, previous ones are cited and referred to in the context of certain rules. Scientific mistakes made in the studies, whether intentionally or unintentionally, are undermining the reliability of the publication. JAREN considers that the references of the studies which are accepted after the evaluation must be given correctly and completely within the scope of publication ethics. In this context, every work that is accepted is passed from bibliography, cross-reference and citation control by a company which the board finds appropriate. The cost of the control carried out is the responsibility of the author(s). The bibliography is organized in accordance with the procedures and principles contained in the Vancouver Code of Conduct. It is checked whether the in-text citations of each reference are given according to the procedures and principles, and the ones that are incorrect are corrected. References to in-text citations are checked. The missing ones are requested from the writers, and the ones that are incorrect are corrected. The procedures and principles of referring in Turkish are valid for Turkish full text and in English for English text. JAREN requires formality, readability, and uniformity of prints, with a uniform and complete page layout, in accordance with standards. In this context, a company which is approved by the publishing board arranges the page order and string of the studies completed with their plagiarism control and bibliographic regulation. The Digital Object Identifier (DOI) is a unique access number that allows identification and access of any work published in the electronic environment. It is mandatory to give a DOI number for every work published in JAREN or in early edition. After the acceptance stage, the DOI number is given by the editorial board to the studies which are accepted after plagiarism and bibliographic control and are prepared for printing. JAREN values spreading of current and original information. In this context, studies that are accepted by completing the evaluation phase and completed after the acceptance process are electronically published in early printing. Early issued publications are published with the volume and number of pages that the editorial board considers appropriate and are removed from the early edition. Studies in early printing may not be the latest version to be published in the normal issue. Minor editing can be made on the work to be published as a final version. Work submitted to JAREN should have a clear and understandable language quality appropriate to the rules of the language of the full text language (Turkish and English) and the scientific literature. The work should be written in a clean and fluent language that is free from foreign words. In this context, the fact that studies being redacted before submission for evaluation ensures that the publishing processes are maintained in a healthier way.